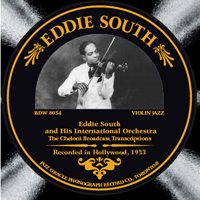 The complete Cheloni broadcasts, recorded by violinist South and his orchestra in Hollywood. This set provides a glimpse of South’s broad repertoire, from popular songs of the day to tangos, rumbas and traditional folk songs. Extensive liner notes by are by South specialist Anthony Barnett. Clifford King (clarinet, vocal), Eddie South (violin, vocal), J. Wright Smith (ensemble violin), Antonio Spaulding (piano, celesta), Everett Barksdale (guitar, vocal), Milt Hinton (string bass, vocal), Jimmy Bertrand (drums, percussion).